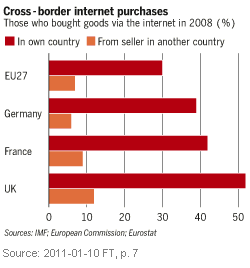 As the graphic illustrates, European consumers still prefer shopping local e-commerce sites. This explains in part why Amazon opened a new Italian website in November 2010. The latter is managed from Amazon’s Paris offices and deliveries are handled by its 360,000 square foot distribution center at Montelimar in southern France. But what role does social media play in all this? Are customer referrals and endorsements making a difference to the way you shop online? Is the increasing content of good enough quality to serve your informational needs? How do you feel when your favorite online community is taken offline? 1. Will you be around for my anniversary? In most cases, things happen very quickly in social media and on the web. Even after just a week, it can be near impossible to find someone’s tweet and average users usually give up quickly. While various tools such as Ning have made it easy for users to create a social network, keeping it alive is a bit more difficult, one reason being that it now costs not only money, but time. For instance, a few months back I visited one of my favorite social network sites and found the screen below. Tip 1: Things come and go. Most tweets or Facebook status updates will not show in the first 20 search results served by your favorite search engine and be forgotten in less than 30 days. The only place where you set the rules is your own blog or webpage, so quality content MUST be posted there. 2. Lots of stuff, but where is the original content? 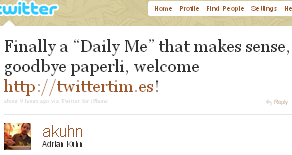 You can slice and dice it in different ways: both Paper.li and twittertim.es are examples of sites where people can share their Twitter feed or other things they find on the web. In turn, the software produces a ‘virtual newspaper’ of tweets, those we follow on Twitter and so forth. Producing such a newspaper may be quick and easy, but does anyone want to read this recycled content? Tip 2: Repeating the same content over and over does not make it better. Sometimes, less is more and the best situation is when recipients value your content enough to crave it, like Godiva chocolates. Sign up with your email to get our next post first; you’ll be glad you did. 3. Can you trust customer testimonials and will your question be answered? So your favorite social network shut down and nobody wants to read your personal newspaper, but what about customer testimonials about a product or vendor, another Facebook Like and so on? Can you trust such recommendations? My experience has been that barely 50 percent of the comments or reviews I find on Amazon match my own reactions to the same content. This means that I will be disenchanted with half of the content I buy based on such recommendations. But I wonder if a Fortune 500 CEO becomes more accessible to lowly workers in New Delhi by writing an internal blog. Just because the CEO blogs or writes emails like Steve Jobs sometimes does (e.g., 2011-01-14 media release – Jobs takes indefinite medical leave), does not mean you will get answers to your questions. Tip: Social media may make it easier to reach people, but being personable is not scalable. When did you write your last birthday card with a fountain pen or reply directly to a customer’s email? Time is limited, spend it wisely on social media. Addressing the issues outlined above enables understanding of how social media may change some things (i.e. more recycled content), but fail to change many others (e.g., quality original content is still hard to come by). If you like this post, please share it with your friends. How about asking them to comment after reading, I love to hear what people think! Are you with me on these critical challenges? Please leave a comment; the floor is yours! @40deuce thanks for the flowers. Yes and this scalability issue is the Achilles heel of social media because customers demand a personable and authentic response. Unfortunately, we have limited time only.